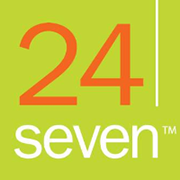 Agency Description: 24 Seven Talent Recruitment Agency specialises in IT and Digital marketing jobs in Central London. 24 Seven Recruitment agency is specialized in e-commerce recruitment by building their online presence with online merchants and merchandisers, SEO/SEM specialists. 24 Seven has become the top recruiter in IT and Digital Recruitment industry in London. 24 Seven Recruitment agency consistently provides top freelance & fulltime talent to the biggest Beauty Saloons in London and emerging boutique brands in the Beauty industry. 24 Seven Recruitment agency also provides jobs for beauty specialists; Make-Up Artists and Freelance Beauty Consultants for companies in London. With 24 Seven Recruitment agency, you can register with them as a freelance IT contractor or freelancer for IT jobs. Directions: The 24 Seven agency is located near Soho Square Gardens in Dean St. Buses; 14, 19, 24, 29, 38, and 176 will stop in Charing Cross Rd and Shaftesbury Ave. Underground Station; Leicester Square Station - Northern and Piccadilly line.